Entertainment in South Korea - Movies, Sport, Theme Parks And SHOPPING!! Entertainment in South Korea will delight and keep you enthralled with movies and dramas, live shows, sports, theme parks and lots of shopping!. You see, South Korea is definitely a country where there is plenty to see and do, whether you are a first time visitor or a local -- there is something for everyone. It is indeed a country based around entertainment, so get ready for fun, fun, fun! If you have a young family, what better way to make them happy than to visit one of the many theme parks that South Korea has to offer i.e. 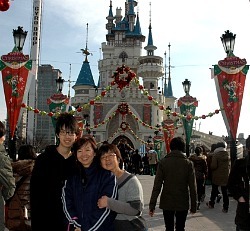 Lotte World, Everland, Caribbean Bay and many more. Hey .. you will find that the theme parks are not just for the kids. When you combine a great hotel stay along with the variety of live show and performances, parades, games and rides, adults will experience the joy of reliving their childhood and many will find that they are still a big kid at heart. The Koreans can be really fanatic about their sports - especially soccer, baseball, badminton and even cycling. If you are more of an outdoor person who love adventure then you should not miss bungee jumping and with the experience and beautiful scenery it is absolutely one of the must try activities in South Korea. Water rafting, zipline or flying fox are also enjoyable experience that is fun for people of all ages. If theme parks and extreme sports sound a bit exhausting, how about relaxing by watching one of the many live performances that South Korea has to offer. 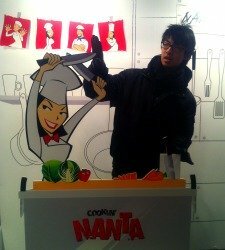 Nanta also known as "Cooking" is the top rated live show performance integrating South Korea's unique beat. I will vouch that the "Nanta" is one of the funniest and worthwhile shows to see. This musical extravaganza stems from a story line of a few chefs and their chaotic culinary preparations. Using body language and pots and pans as their musical instruments, the act combined comedy with events in the kitchen. On my trip to South Korea last year, I was also fortunate enough to experience the "Jump" martial arts live performance, and with their advanced martial arts and acrobatic skills incorporating plenty of comedy I was definitely impressed with the artists, comedy and performance and am just so glad we went for the show! Asian countries in particular are hooked on Korean TV dramas (Dream High, Coffee House, 49 Days etc) and for movies, so why not come down to one of the many cinemas' across Korea to enjoy some of the latest Korean and English movies. Korean pop music aka kpop has also become an integral part of the Korean entertainment scene, and has not only caused a major splash in the Korean market but has expanded to all corners of the world. Nowadays, allkpop is branching out from just the music aspect of the entertainment industry. JYP Entertainment has also produced the Korean drama "Dream High" and has cast many allkpop idols as the main cast including: Taecyeon, Wooyoung, IU, Eunjung and Suzy, additionally having cameo appearances from 2PM and Miss A. Following this example SM Entertainment has announced that they too will be producing a Korean version of the Japanese drama (Hana Kimi). Korea is known as one of the fashion capitals of Asia, so while you are here you definitely cannot miss out on experiencing shopping! There are shopping districts with apartment hotels to accommodate everyone, whether you love your branded products, like looking for a bargain, souvenirs I guarantee that Korea will have the something for you.